If I buy NAC as a loose powder in a large bag, as opposed to in tablet form, will it spoil? I've heard it can spoil or degrade into a harmful by-product. NAC (N-Acetyl-Cysteine) powder can be stored in a closed container at room temperature (away from high heat or humidity) for at least two months, and possibly longer, without spoiling or degrading. Small amounts of NAC may degrade, over longer periods of time, into a by-product called di-NAC — however, this substance is not known to be harmful. (The sulfur in NAC may cause a "rotten egg" odor, but this does not indicate a problem.) 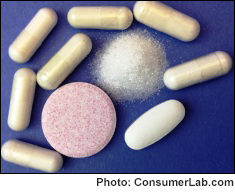 If you are concerned about degradation, consider capsules or tablets, as they may be more stable than powder. See ConsumerLab's Review of NAC (N-Acetyl-Cysteine) Supplements for our tests of popular NAC supplements and our Top Picks among products, including cost comparisons and information about where to buy NAC. If you store your powders in wide-mouth, air tight bottles like Nalgene (Polypropylene) bottles of 500 mL/approx. 16 oz or 1000 mL/approx 33 oz, you should be fine. 1 Kg will generally fit into a 1000 mL bottle. For speed use a wide mouth funnel. Be sure to add one moisture removing, 5 gram silica gel packet (paper, not cloth), so the powder won't turn into a brick. Be sure to cap the bottle tight immediately after spooning out the powder for use. Amazon sells less expensive Nalgene-like bottles. Always turn cap tight. Never had one leak and we have bought dozens of them for both liquids and powders. They also sell the silica gel packets. Read the reviews so you'll get the right packets. This question makes me wonder about several supplements our household has purchased in bulk powder form that were opened several months ago but not yet used up. I suppose it depends on what the supplement is as to how long it is good for, and the conditions under which it is stored. We have purchased Vitamin C, Magnesium Citrate, Inositol, DMAE, Piracetam, Choline, Organic Sulfur (MSM,) and Glycine, that I can think of. I suppose one should check with the manufacturer. I also bought Glycine as a powder. I live in Hawaii and because of the humidity, it turned so hard I needed to use an ice pick to break it up. I've still been taking it but now I wonder if it is effective or even safe. this makes me think that it's a good idea to eat fresh whole foods, then, for the most part, we wouldn't have to take supplements. This CL Answer initially posted on 3/28/2015. Last updated 2/28/2019.